I thought I might start a little series of posts on easy weekend lunches, that feed loads, are easy to prepare and make a memorable event. A few weekends ago we had my mum and dad round and I really wanted to make a light two course lunch that was full of winter loveliness. Last year I made this super yummy borscht with mushroom dumplings which went down a treat. It's that time of year again where beetroot seems just right. 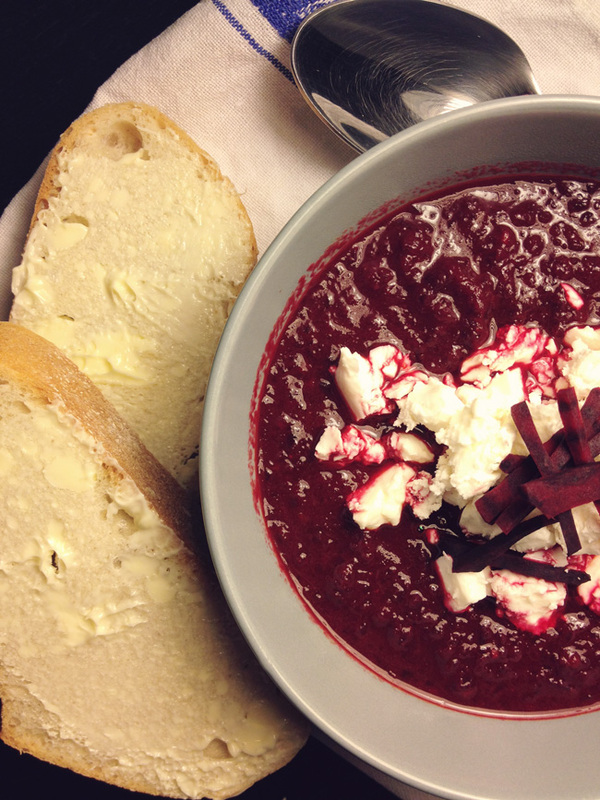 So for starters I made an earthy, thick beetroot soup with tangy feta and a crusty rye bread. One thing I often dislike about winter lunches is that they are too heavy and you end up being so full after starters that you can hardly stomach mains let alone pudding. 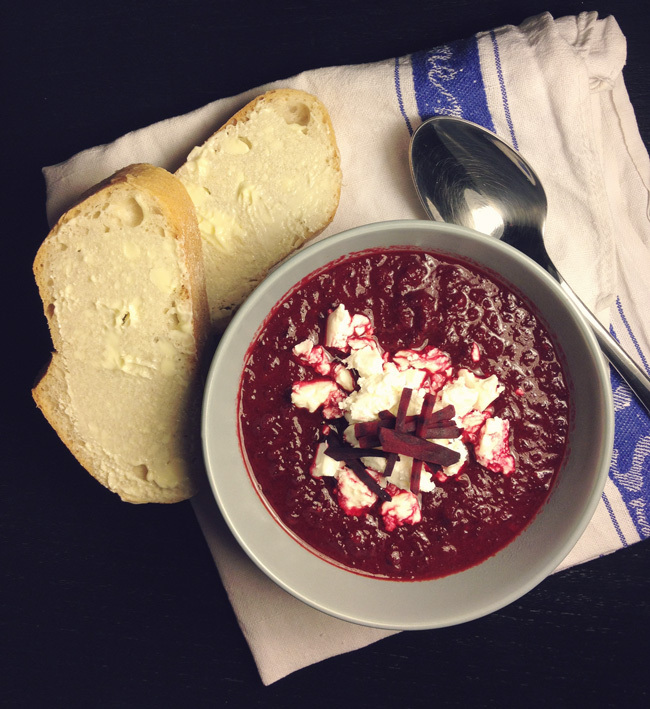 This little beetroot soup is just the right amount of filling to get you started. Make it on Saturday and just re-heat for Sunday lunch. You'll save time and gain extra flavour. Heat some olive oil in a medium size saucepan. Once hot add the onion and sautee for a few minutes, until soft. Add the garlic and cook for a minute or so then add the tomato puree and stir until well combined. Mix in the diced beetroot, tomatoes and stock. Turn down the heat to medium and simmer for 30-40 minutes until the soup's thickened and reduced. Stir occasionally. Blitz with a handblender. It doesn't matter if you have a few chunks of beetroot left. If you feel the soup is too thick add a little more stock and mix in. Season to taste with salt and pepper, bearing in mind that the feta is quite salty. 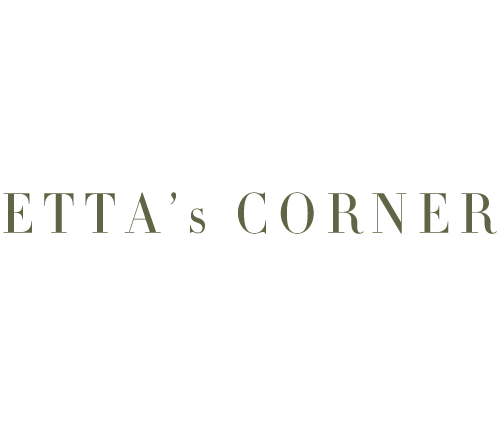 Dish up into soup bowls and top with the crumbled feta, grated beetroot and the chopped dill. Serve alongside buttered rye bread. This soup is great cold too and you can substitute the tinned tomatoes for 500g of roast tomatoes in the summer. But to me this just screams winter starter :) Enjoy with a glass of light red wine. Main course of pork fillet and warm lentil salad to follow shortly. Recipe taken from Hugh Fearnley-Whittingstall and adapted by Etta. Hi, I just stumbled across your blog and I love it! This soup looks amazing and with the feta and rye bread? What an awesome combo!